On October 15, 2014, Dr. Garrett Adams, Medical Director of the Beersheba Springs Medical Clinic and immediate past president of Physicians for a National Health Program, gave a lecture at Sewanee: The University of the South. Dr. Adams’ lecture addresses the plight of America’s medically under-served, especially in Appalachia, how America’s wealth inequality affects the nation’s health and society, and the positive effects a publicly funded national health program could have on our society as well as our national health. Video. 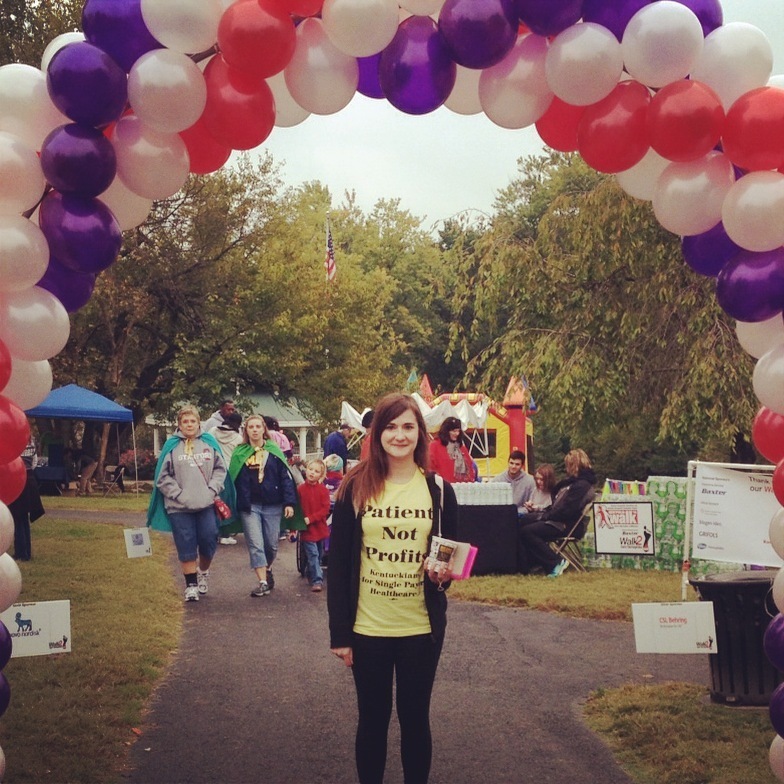 On Saturday, October 11, 2014, Kentuckians for Single Payer Health Care participated in the first annual Kentucky Hemophilia Walk in Middletown’s Wetherby Park. Braving the chilly weather, KSPH distributed over 200 flyers with information about single payer healthcare, noting that with the ACA, many individuals with bleeding disorders and other chronic conditions still find essential treatments too costly or not on their insurers’ formulary – a situation fully understood by hemophiliacs and their families. The flyer provided information on HR 676 and ways to join the movement locally. 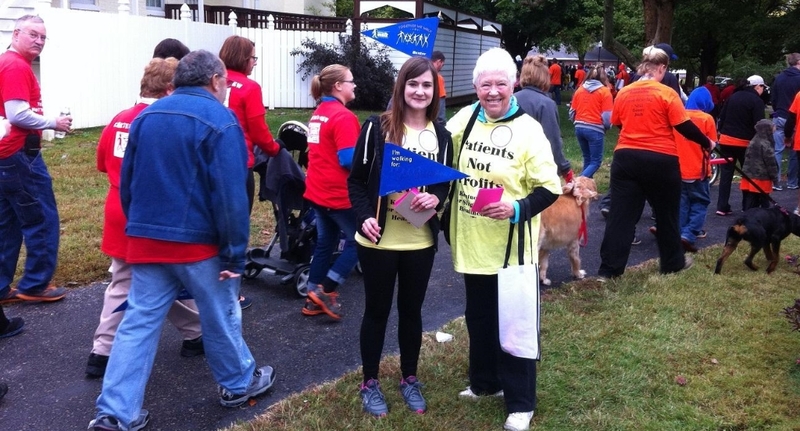 Walkers were appreciative of KSPH’s presence, and over $30,000 was raised for the Kentucky Hemophilia Foundation. All in all, it was a very successful event! Jamie Beard at the start/finish line. Jamie won the award for raising the most money for the Kentucky Hemophilia Foundation. 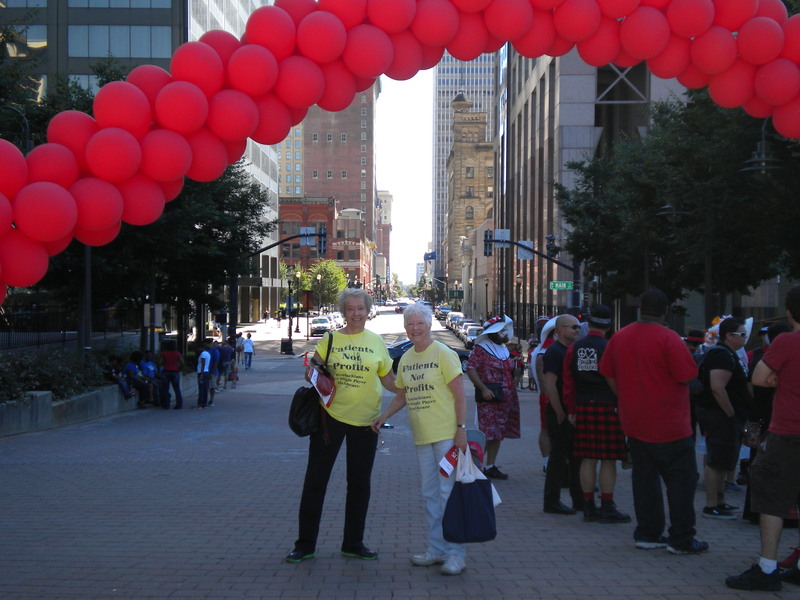 On Sunday, September 21, 2014, Kentuckians for Single Payer Health Care joined a spirited crowd and their pets for the Louisville AIDS Walk, Fleur de Life. KSPH distributed 400 flyers with a message noting that while health care reform helped some, many with AIDS and other conditions still find essential drugs too costly or not on their insurers’ formulary. “Last July, 300 patient advocacy groups protested to Health & Human Services that those with chronic illnesses are still facing barriers to care,” the flyer continued. “A bill in Congress, HR 676, Expanded & Improved Medicare for All, will provide care for everyone under a single payer, publicly funded system. All medically necessary care including dental & drugs will be covered–and you choose your doctor. “No co-pays, no deductibles, no limited networks. No worry about medical bills! Monies now going to corporate profits will be available for care. “We invite you to join this movement. Kentuckians for Single Payer Health Care meets 1st & 3rd Thursdays each month, 5:30 pm, Board Rm, Mezzanine, Louisville Free Public Library, 301 W. York. 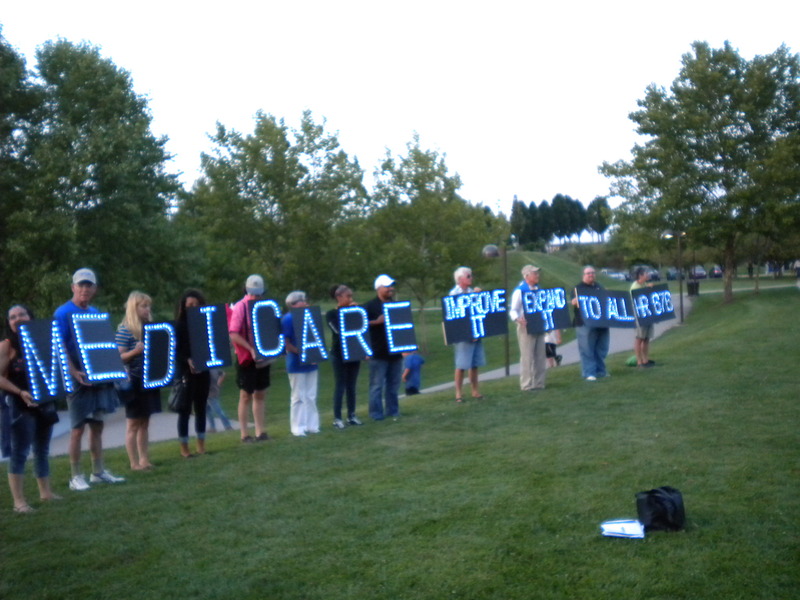 The walkers thanked us for being there and many expressed their agreement with single payer. 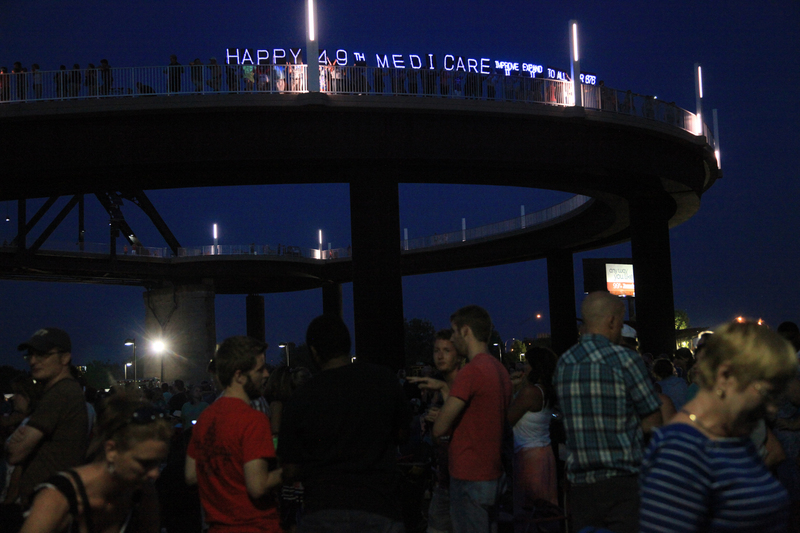 Thousands attending a riverside concert on July 30, 2014, saw the message curving across the city skyline. Louisville joined dozens of cities in celebration of our nation’s best health program. We must protect Medicare for it has lifted generations of seniors from poverty, made the hospitals of the South integrate because Medicare could not be collected by those who segregated, brought dialysis to all with kidney failure, and shown that this public program works efficiently and saves money. Yet we must improve Medicare for even with it some cannot afford care–it does not cover dental, nor hearing aids, nor nursing homes, co-pays and deductibles are growing, some drugs are very expensive, and it is being privatized through the Medicare Advantage plans. 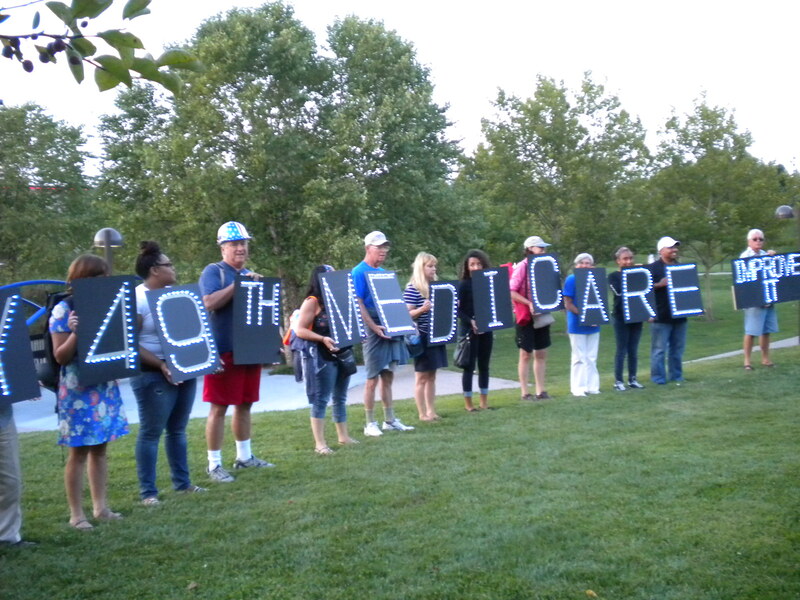 And we must expand Medicare so that every person, regardless of age, has health care. By passing HR 676, national single payer health care, we will secure Medicare, save billions, and make health care a human right. The message floats above the city lights–and the moon. Photo by Carrie Irwin. 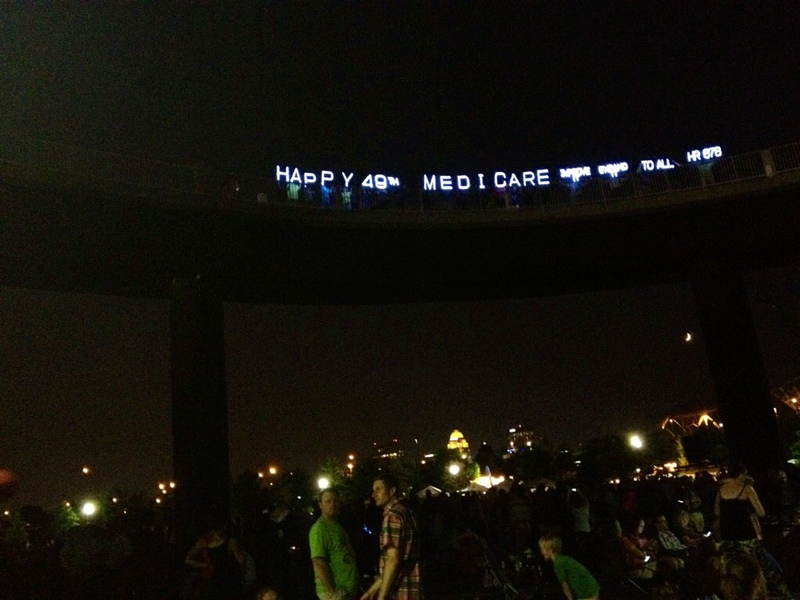 Kentuckians for Single Payer Health Care is delighted to bring the first Light Brigade to Louisville. 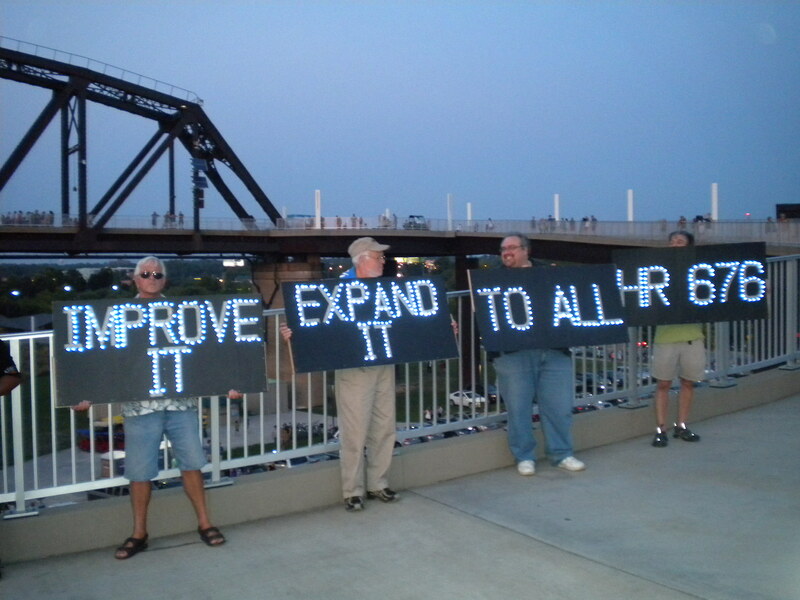 We thank Leslie Harris of the North Texas Light Brigade and the Overpass Light Brigade for the inspiration and the guidance. Thanks to all of the letter carriers who braved the difficult parking conditions to lift up the message. 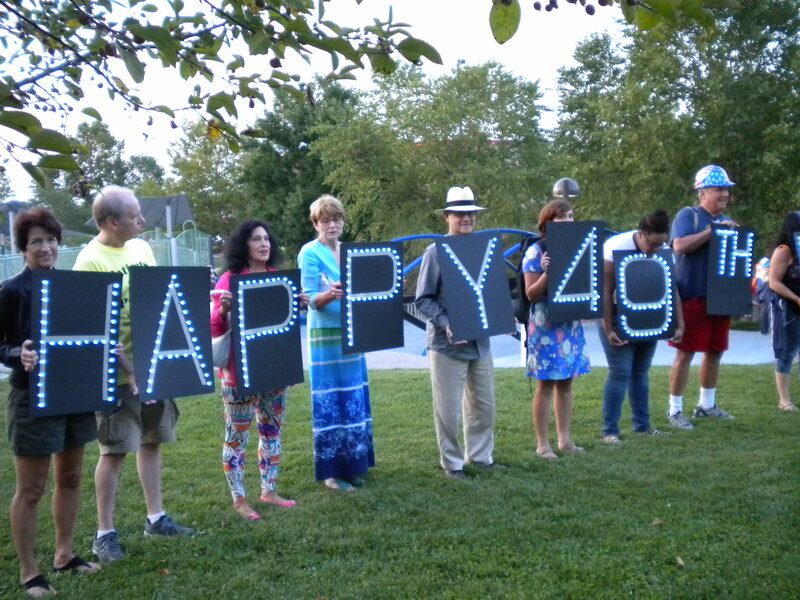 Thanks also to the lettermakers, Harriette Seiler, Peg Box, Dave MacCool, Betty Schmitt, Garrett Adams, Lane Adams, Jill Harmer, and Kay Tillow, who put the signs together from corrugated plastic and LED lights run by batteries. 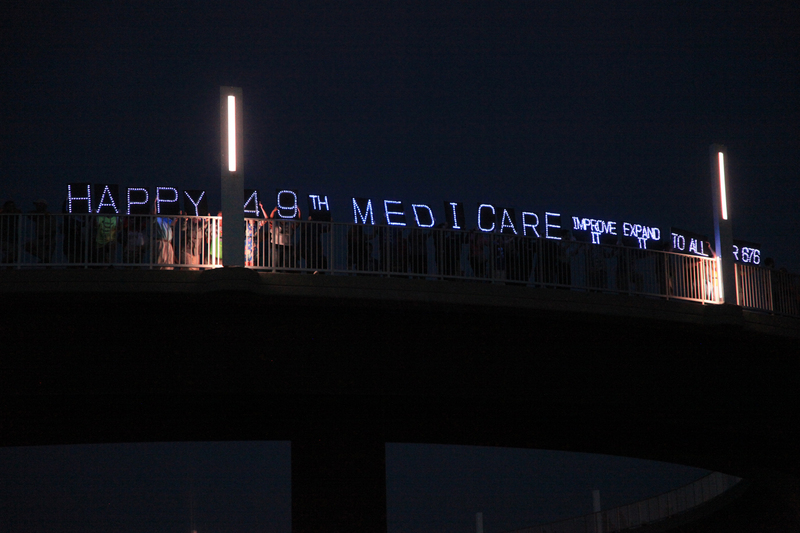 Improve Medicare and Expand it to All–Pass HR 676! 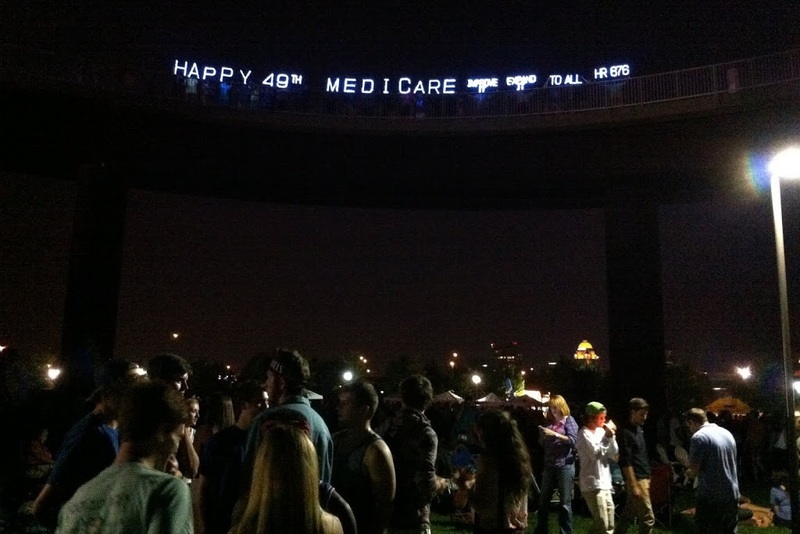 July 30, 2014, will mark the 49th anniversary of Medicare, our only publicly financed, universal health plan, which lifted a generation of seniors out of poverty. 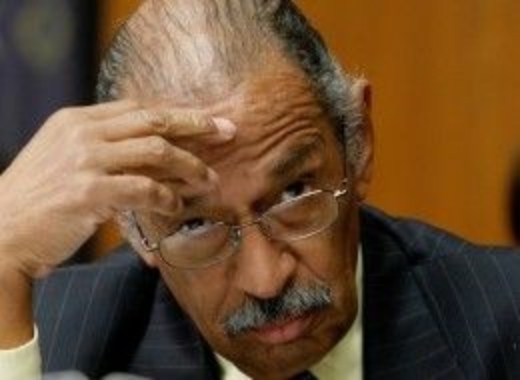 Congressman John Conyers has reserved 30 minutes on the House Floor for this. Dozens of events will happen, making this a national action! 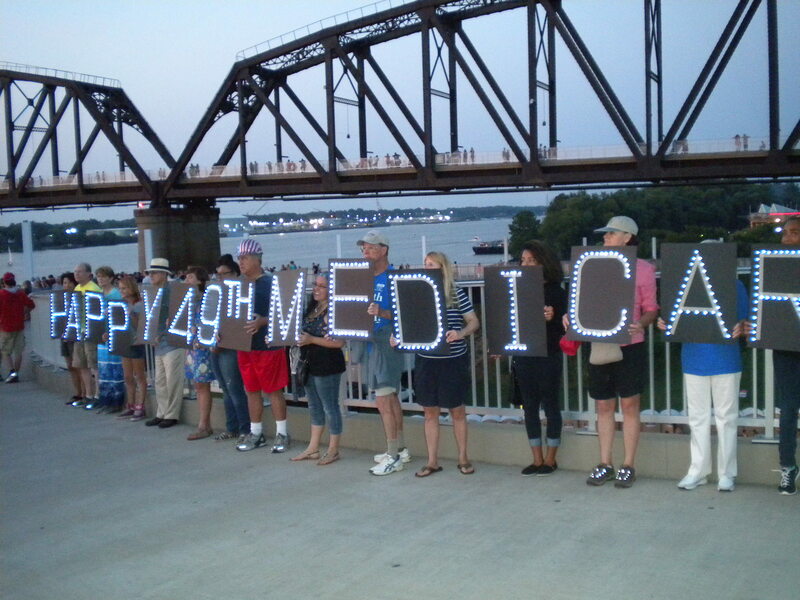 We will have a special celebration in downtown Louisville that will take place on the evening of Wed. July 30, and will involve individuals carrying lightweight signs to spell out a message. We need 20 committed people for the signs–plus more to help us leaflet. 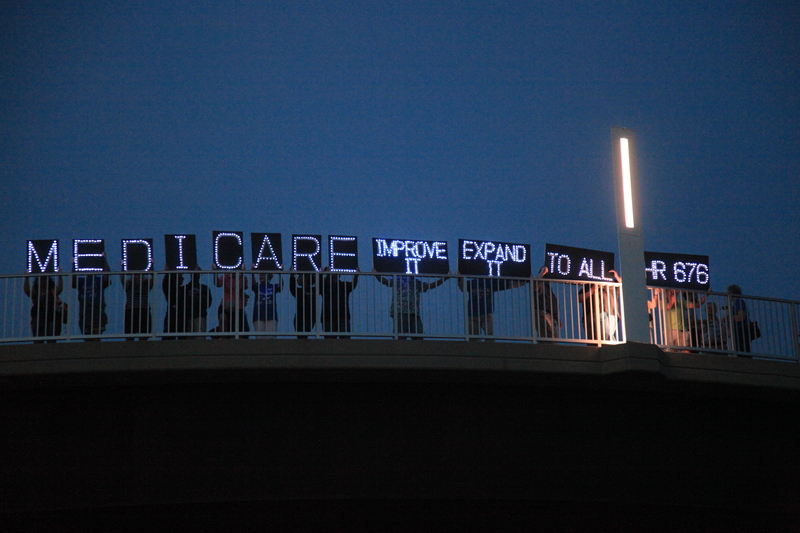 Single Payer: Where Do We Go From Here? 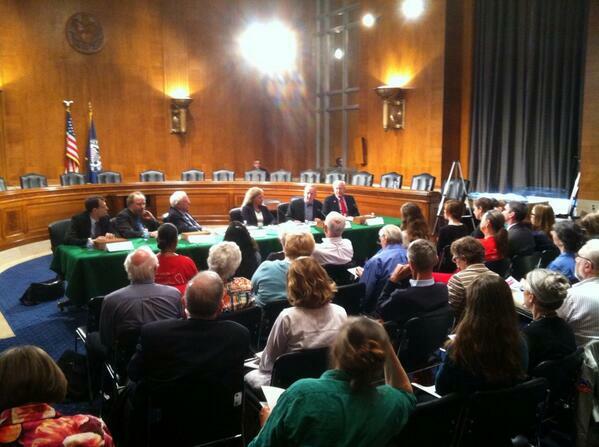 On May 21, 2014, in the Dirksen Senate Building on Capitol Hill, Senator Bernie Sanders chaired a panel with single payer leaders. Video here. The video begins at the 25 minute mark. “We win the argument on the merits.” Remarks. 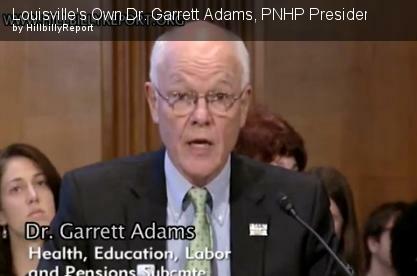 “We should fight further privatization of health care.” Remarks. “Single payer would work–we could do this.” Remarks. 1:01:00 Senator Sanders starts the discussion which ends at 2:16:17. 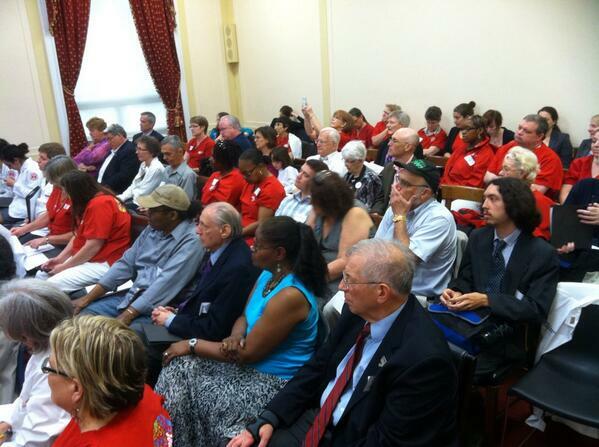 Pictured above are some of the participants in the National Single Payer Lobby Day held in Washington, DC, on May 22, 2014. The event was sponsored by: All Unions Committee for Single Payer Health Care – HR 676, American Medical Students Association, Gray Panthers, Healthcare-NOW!, Labor Campaign for Single Payer, National Nurses United, National Organization for Women, Physicians for a National Health Program, Progressive Democrats of America, and Public Citizen. Story by Julie Rovner, Kaiser Health News. Story by Anne Meador, DCMediaGroup. On Thursday, May 22, 2014, Congressman John Conyers, Jr. (D-MI) (above photo) and Dr. Andy Coates, President of Physicians for a National Health Program, will speak at 10:00 AM in Room 2226, Rayburn Building, to a House briefing on single payer that kicks off the lobby day. Details here. Congressman Conyers is the chief sponsor of HR 676, Expanded and Improved Medicare for All, national single payer legislation that would assure universal care. With the addition of Janice Hahn of California’s 44th District and Tim Ryan of Ohio’s 13th district, HR 676 now has 57 co-sponsors. If you cannot go to DC, you can still participate in this national effort. Please call your congressperson on Thursday, May 22 and urge her/him to sign on to HR 676, Expanded and Improved Medicare for All. Call the switchboard at (202) 224-3121 and ask for your representative. You can find out who your representative is by entering your zip cope here. KSPH reached out to hundreds at the Mighty Kindness event at Waterfront Park. Skies were sunny; mood was upbeat. Children danced with butterfly wings and the painted faces of lions. We forgot the duct tape to attach the banner to the table, but the day was delightful. Lots of conversations about single payer and many signed the petition for HR 676. L to R: David Ross Stevens, Larry Hovekamp, Harriette Seiler, Kay Tillow, Dave MacCool. Also Rose Stevens and Tyler Fairleigh helped to put up and staff the booth. 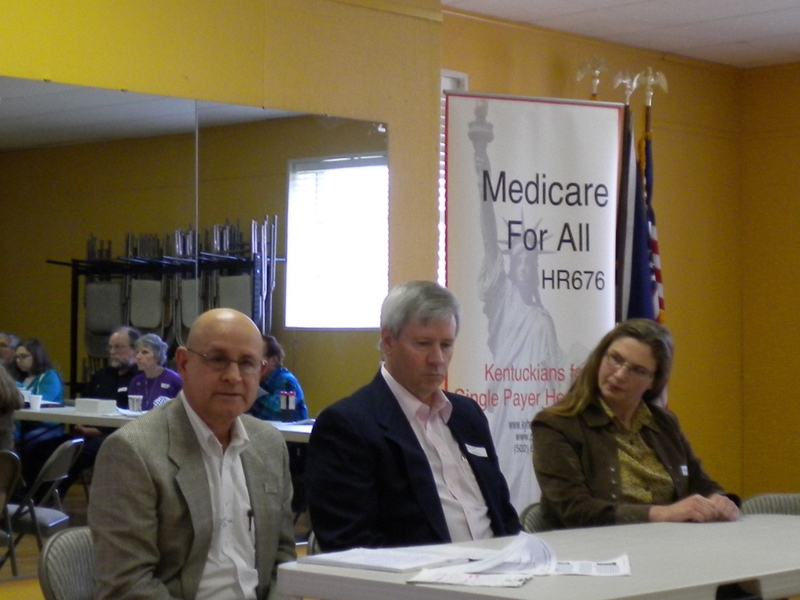 Ed Weisbart, MD, spoke on single payer in Louisville in a four event whirlwind over three days, April 10-12, 2014. 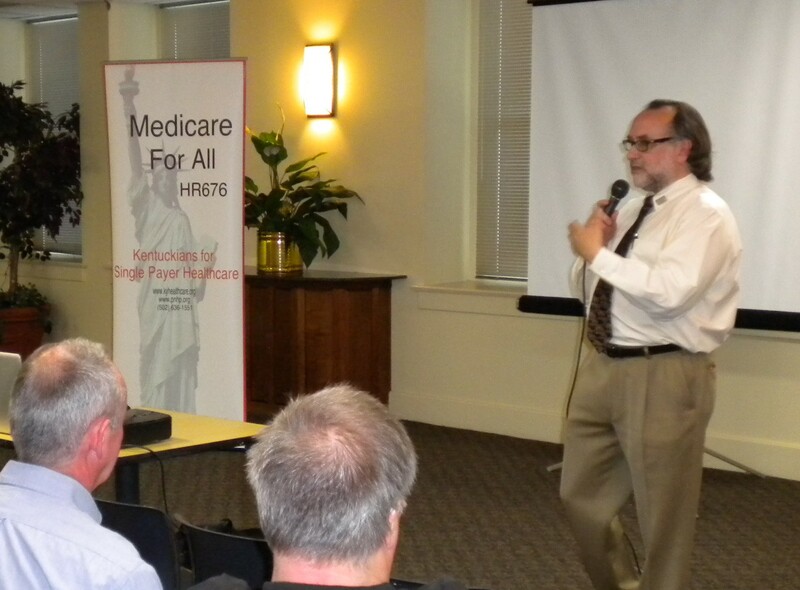 Ed Weisbart, MD, Chair of Physicians for a National Health Program–Missouri, explains single payer health care during a public program at the Old Medical School in Louisville on Thursday, April 10, 2014. 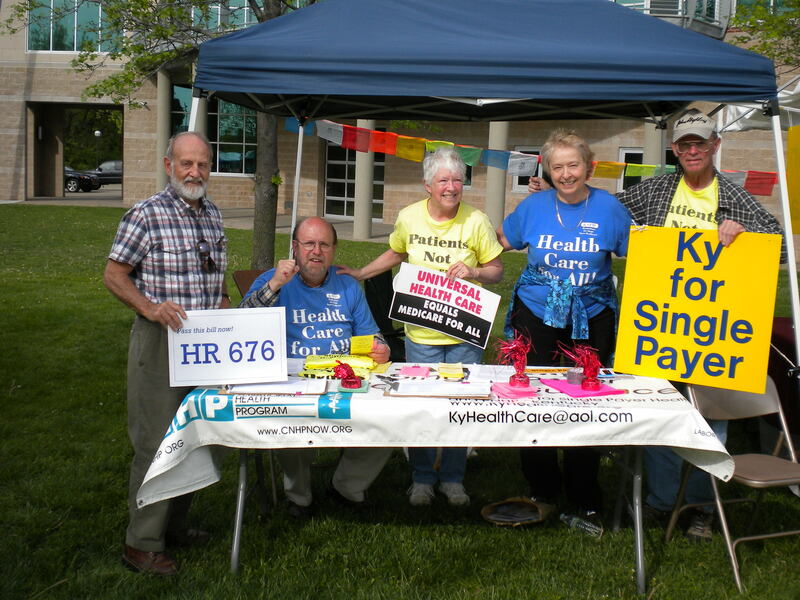 Some of the participants in the Kentuckians for Single Payer Health Care workshop and PNHP-KY Annual Meeting on Saturday, April 12, 2014. L-R: Carol Tvaroh, Ada Beale, Tyler Fairleigh, Tom Moffett, Dr. Garrett Adams, Dr. Scott Graham of Fredonia, KY, Dr. Kenny Zegart, and David Ross Stevens of Borden, IN. Edgar Lopez, MD, moderated a panel of Kentucky physicians at the PNHP-KY Annual Meeting. They spoke about what is currently happening to patients and to medical practice. L-R: Dr. Lopez; Scott Graham, MD, Fredonia, KY; Tracy Ragland, MD. In addition, Esther Costel, MD, was on the panel. Doctors Edgar Lopez and Garrett Adams at the PNHP-KY Annual Meeting. 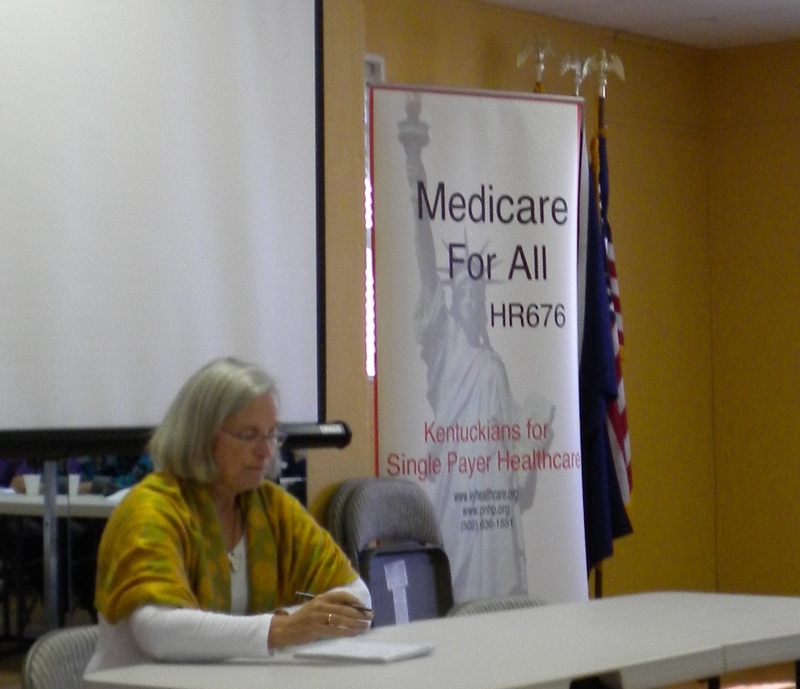 Dr. Carol A. Paris spoke at the PNHP-KY Annual Meeting on “Fighting for Single Payer in the US and Health Care in New Zealand.” Dr. Paris, a member of the Baucus 13, has just returned from a year of practicing in New Zealand.